Personality: He is evil. His soul is black, his heart cold. He's a diagnosed psychopath, incapable of feeling human emotion. History: Sonyo Akuma. Born to the wretched Akuma clan, a group of cannabalistic cultists. The child was born on the same day as the famed priestess turned goddess, Seftu. The first Akuma to share her birthday in fifty years, the previous not surviving a week. It is prophesised that he is destined to lead the Akuma to greatness. To power. And more importantly, to war. He was given strict home schooling. He was forced to reach perfection, No less could be expected of an Akuma. Ofcourse, it was difficult to punish him for failure. If he was a prophet, to strike him would be a deadly sin. He wanted to look more 'evil' to fit in with his reputation, and blond hair was not doing it. Blond was not an evil color. So, he tried to die it red. The fact that it came out pink is evidence that 9 year olds should not be allowed to play with hair dye. Of course, he liked it. So, he's kept it that shade ever sense. Through the acadamy he was, for the most part, left alone. A few people picked on him because of his hair, but when they found out he was an Akuma, they let him do as he pleased. He was feared, and he liked it. After graduating the acadamy, he is now a genin. He craves power, and he is in the perfect clan to aquire it. *Glove Blade- The Glove blade is a leather gauntled, with a two foot dagger protruding from the fist. It is worn on the right hand. The leather is half an inch thick and goes up to the elbow. 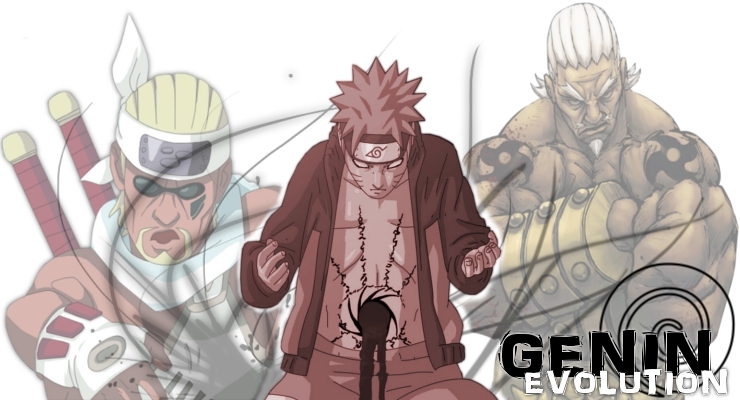 Killing Intent- Sometimes thought to be Genjutsu, its not really a jutsu at all. Some people merely have a dark presence that makes people feel as though they are going to die. The fear of death can sometimes be so strong that victims see their painful deaths flashing before their eyes, and thus the misconception that this is a genjutsu. Cauterize- A clan Jutsu used to close open wounds with fire. It burns the wound to stop the bleeding, although it will still need medical attention. Prayer to the Gods of Slaughter- Not neccasarily a jutsu, but it is quite effective. By asking Jashin and Seftu for strength, the user is put into a trance where they cannot feel pain or fatique. While the effects are still apparant on the body, the mind fails to register them. Most people who use this prayer against a skilled opponent end up dying, because they refuse to retreat or surrender. The target ends up taking quite a bit of damage aswell though.